Braising uses very little fat but keeps all the juices locked in. Here sugar, ginger, soy sauce and spices flavour the braising liquid for a succulent, tangy dish. It's easy too, as it is all cooked in one pot. Place the ginger, stock, soy sauce and wine or sherry in a medium pan with 300ml cold water, the sugar, five spice and orange zest. Bring to the boil and simmer for 5 minutes. Meanwhile, heat the oil in a non-stick frying pan and add the pork. Fry quickly over a high heat until browned on all sides. Add the liquid to the pan. Cover and simmer for 20 minutes, turning occasionally, until the pork is cooked and there is no pink meat. Transfer the pork to a board, cover with foil and leave to rest for 5 minutes, then cut into thin slices. Discard the orange zest from the pan and add the red pepper. Simmer for 3 minutes, then add the pak choi and pork slices and cook for 2-3 minutes until the pak choi is just wilted. Divide the noodles between two deep bowls, loosening and separating them with your fingers. 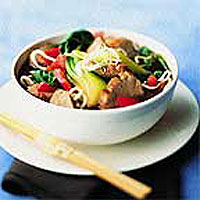 Ladle the pork, vegetables and broth over the noodles and sprinkle with shredded salad onion just before serving.